Total weight gain/loss: I feel like I've come to a halt in gaining weight. 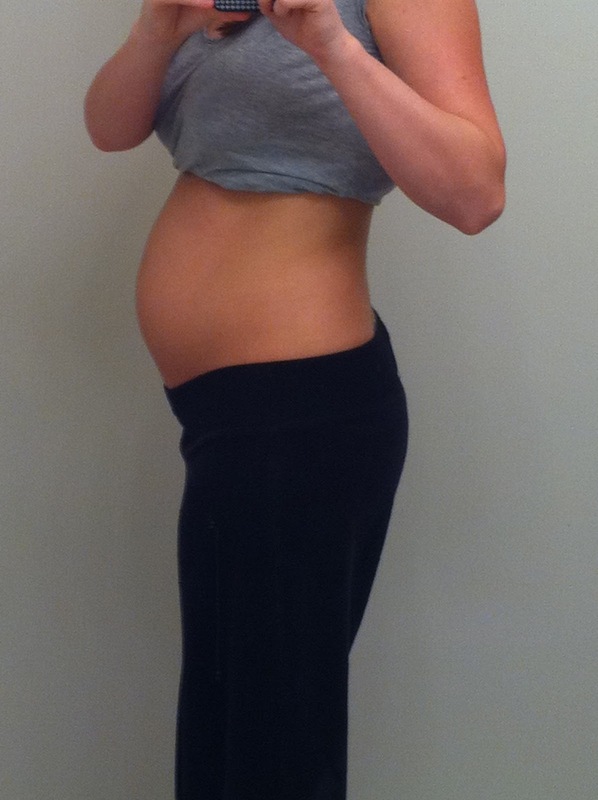 I feel like my stomach hasn't gotten bigger, just rounding out a little bit, ya know? Hence the collage. Maternity clothes? If I want to be comfortable then they are a must! I'm loving the maternity shirts because they're much longer than non-maternity! Stretch marks? So far so good! Sleep: Much better thanks to my our new feather-mattress-topper thingy my Dad bought me us! It's Heaven! Best moment this week: Shopping for Baby P! My Mom got her two super cute outfits and then I went up to my Dads house in Huntsville where me, him, and his fiance Melissa went on a may-jah shopping spree! I'm talking, major. Like, had to buy one of those big plastic bins to store everything in. And and AND I went to Pottery Barn Kids in Birmingham on my way home and got her baby bedding! Movement: Baby Girl LOVES some music. More specifically, T-Pain's "Buy U A Drank" and Lil' Mama's "Lip Gloss". She kicks up a storm when I'm jamming out! Food cravings: I'm on a cheeseburger kick. It's the only kind of meat I really crave. I haven't had a steak since being preggo which is really rare for me! Gender: We have had another confirmation that it's a girl! Belly button in or out? In..but getting shallow-er....more shallow? Whatever. It's weird and gross. What I miss: Not having heartburn. What I am looking forward to: The Bachelor being over with so I don't have to listen to Brad announce every episode that he has an "intense connection with all the girls". Oh, you mean "what am I looking forward to" in my pregnancy? Silly me...um....pool time! The weather has been so nice lately and I can't wait to float in some water all Shamu-like! Weekly Wisdom: If Tums is all you have for dinner at night then so be it. Milestones: Well, is 19 weeks half way or is it 20 weeks? If it's 19 then hall-a-lu-yer I have survived half of a pregnancy!